The Toyota Alphard is a full size luxury MPV manufactured by Toyota. The car is known for its high class luxury experience in the second row. See Wikicars' comprehensive Toyota Alphard Review. The new Alphard features new exterior design which look more like a Lexus car.The interior has been redesigned to be more luxurious and classy. Buyers can choose either they want a 2.4 liter Alphard or 3.0 liter Alphard.Buyers can also choose whether they want the FWD or the AWD.There is also the hybrid trim.The second generation has an optional 7 speed CVT transmission.In Indonesia, the trim of the Alphard that is sold in the official Toyota dealers are 2.4 X , 2.4 G , and 3.5 G.The 3.5 G has the most luxurious features and interior quality. Specifications, details, graphs, pictures and other information regarding the powertrain is placed in this section. Please make sure to write information of the vehicle's performance in a third-person point of view. This section should include information about the car's acceleration figures, handling, braking, etc. If using information gathered from Road Test articles from a reputable automotive source, then please make sure to cite the quote. In Indonesia there are 6 different variety of colors,they are White Pearl Crystal Shine,Black,Dark Blue Mica,Silver Metallic,Gold Pearl Crystal Shine,Beige Metallic.The 6 variety of colors that are mentioned before are the available colors on the official Toyota dealer in Indonesia,while local importer might provide another optional color.the Black and White Pearl Crystal are the most popular color in Indonesia. To attract young executives, Toyota made an Alphard based car called the Vellfire.The Vellfire has a different styling from Alphard.Toyota designer said that the Vellfire is targeted for young people who want an Alphard that looks more stylish. The first and second generation of Alphard have their hybrid version.The hybrid Alphard uses a feature called electric throttle wire which leads to better fuel consumption and gas response.As the result,the gas feels lightweight although it is a very large car.It also features a window tint that can reduce the amount of solar radiation coming into the cabin.This will let make the passengers require less air conditioner energy to cool off which improves efficiency. The car features an electric adjustable foot rest in which the competitors doesn't have.This feature can also be found in a more expensive cars such as the Maybach 62.Toyota's resale value,reliability,and spare parts cost are also one of the strength. The interior of the first generation of Alphard is dark.The second generation has beige color interior to give a spacious feeling.The seats of the Alphard are captain seats,in which both seats in the second row are separated to give more space for the shoulder room.The second generation Alphard has larger arm rest.The seats on the second row has an electric adjustable foot rest which can also be found in more expensive cars such as Maybach 57. Because the Alphard is originally segmented for Japanese market,owners that live outside Japan would find it difficult to operate the sat/nav system , as it is using Kanji letters instead of English. After the Alphard has ruled the luxury MPV segment,Toyota decided to update the Alphard into a whole new car.The exterior has been redesigned to follow Toyota's new design language concept (as seen in the tenth generation Toyota Corolla).The interior of the new Alphard only has little differences.The second generation is 15 kg heavier than the previous one.The styling of the second generation came from Toyota FT-MV concept. The first generation of Alphard was introduced in 2002.It was made for Japanese market only.However,many importers imported Alphard to several countries such as Indonesia,Singapore,Hong Kong,Taiwan,and Korea.The Alphard became the best selling luxury MPV in those countries. 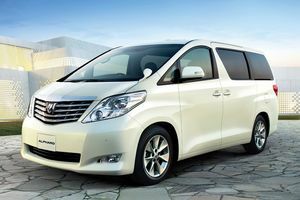 The first generation of Alphard was originality made for Japanese segment.But there are importers in different countries that import the Alphard.The second generation of Alphard is sold in the official Toyota dealership in Indonesia.IN the first year ( 2008 ), only they only provide the 3.5 G trim in the official Toyota dealership line up,and later,2 new trims are available : the 2.4 X and the 2.4 G.Both of these new trims are segmented for those who think that 2.4 engine is already powerful enough to carry the car.The 2.4 X trim has less features and a lower interior quality. It is one of the most popular luxury cars in Indonesia, along with Toyota Harrier, Toyota Land Cruiser and the Mercedes Benz S-class. In Indonesia, people who own Toyota Alphards are considered upper-class, considering that the price of the Alphard is very expensive in the country.Most Alphard owners own a private driver in Indonesia,as they think it is unsuitable to be driven by the owner.The Alphard is considered as a "private limousine". This page was last edited on 7 December 2010, at 10:10.